Regardless of Number of Filters! Enhanced Laminarity Provides Improved Cleanliness Class! 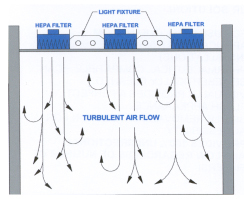 PROVIDES 100% UNIDIRECTIONAL AIRFLOW REGARDLESS OF NUMBER OF FILTERS! 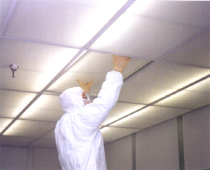 The secondary grid ceiling system creates a slight positive pressure which re-diffuses the air uniformly across the entire ceiling entrance plane. 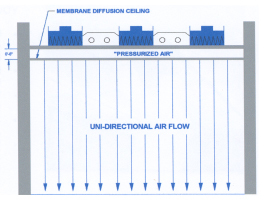 Virtually true laminar flow is delivered to the room regardless of filter variations or filter coverage, eliminating turbulent air flow as air travels from the entire ceiling plane in any type of controlled clean air environment.